I didn’t know exactly what to expect from this event, thought I knew it would be arty and involved cycling. I found out about it on facebook, of all places. I was intrigued and got myself a (free) ticket. As the event date approached I felt a little apprehensive, especially as I would be going on my own. Would I have to follow a specificed route? Would I have to cycle in a group, at someone else’s pace? Would I see anyone I know? Which bike would be best to ride? Also, when I realised that it involved being asked questions and making voice recordings of my answers, I wondered whether it would be ultimately embarrassing. What sort of questions would I be asked? On the day, the weather turned out to be lovely, warm and sunny – the hottest of the year so far. I’d tired myself out teaching and attending yoga classes all day, but as the evening approached I rallied my legs and cylced back into town to East Street Arts’ Patrick Studios, a new place for me. I was the first one there, the first rider of the whole event. I left my bike in the rack outside so a technician could affix a computer mount to the handlebars. Inside I signed a waiver, was presented with a palmtop computer (whatever happened to palmtops? are they still a thing?) and shown how to work it. Then I went out my bike, velcro’d the computer to the mount, popped an earphone in one ear, sorted out the earphone wires so they wouldn’t interfere with my shoulder bag an off I went. I followed the instructions on the screen: start cycling, then find a place I liked. As I set off, the computer played a pleasant theme tune in my one ear, like something from an introspective film, and immediately the ride took on a cinematic quality. the crap cycle ‘lane’ I round myself navigating, which would usually just be irritating, suddenly became exquisitely poignant thanks to this soundtrack. When I arrived at the place I liked I recorded a short introduction on the computer: name and a brief description of myself. Then I was instructed to choose whether to find a new place to “hide” and answer another question, or whether to “search for others” – find their hiding places and listen to their recorded answers to the same question. This time I chose to “hide”, was asked a question and instructed to cycle along till I found a suitable place to stop and record an answer. The questions were direct and sometimes intimate. Not particularly wanting to head into the city centre on a Saturday night, I headed in the opposite direction, along one of the National Cycle Network paths – one that I’d only ridden once before, on a mad day several years ago when I cycled all the way from Leeds to the Yorkshire Sculpture Park. At the start there were lots of people about sitting out on the grass by the river, relaxing in groups or alone, and I felt slightly foolish stopping randomly to seemingly talk to myself and record my answer to a question. As I cycled further away from the city centre, the path became quieter, and there were fewer people around to witness my odd behaviour. In any event, as the ride progressed, I became more absorbed in what I was doing and less self concious. When cycling I often feel like I am travelling in a marginal, parallel universe to that inhabited by motorists and pedestrians, and participating in this art game accentuated that feeling. After an hour or so the computer instructed me to start to head back. When I returned to Patrick Studios the staff took the computer off me and pointed me in the direction of food and drink. As everyone knows (do they? they should), cyclists are always hungry. The atmosphere was convivial, with some people tooling around on crazy hinged bikes and bike trailers pulled by bmx’s, while others sat and chatted and waited for other riders to return. I joined some friends and we discussed our experiences. Everyone agreed they would have enjoyed staying out long playing this art game – most of us felt that we were just getting into it and hitting our stride when the computer recalled us back to base. I’m not sure what they are planning to do with all the recordings once the event has finished. 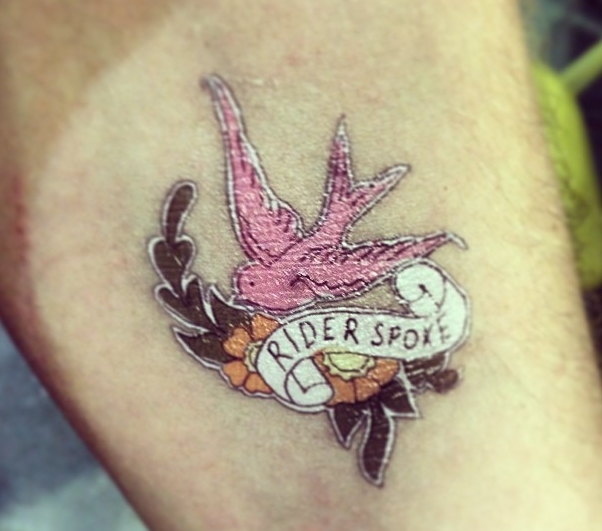 Rider Spoke is just one of a number of bicycle-related events being put on as part of Juliana’s Bike as the idea for BikeFestLeeds becomes reality. What an intriguing idea for an event. It sounds like you had fun and were really starting to get into it, Myka. I too am curious about the possible posting of the recordings at the event’s end. Thanks for commenting, I was also wondering about the recordings but also the mapping. I think that between 70-100 people did the event, it would be interesting to see their journeys plotted on a map of Leeds. That combined with the recordings I’d find fascinating. I’ll see if Blast Theory have any plans.